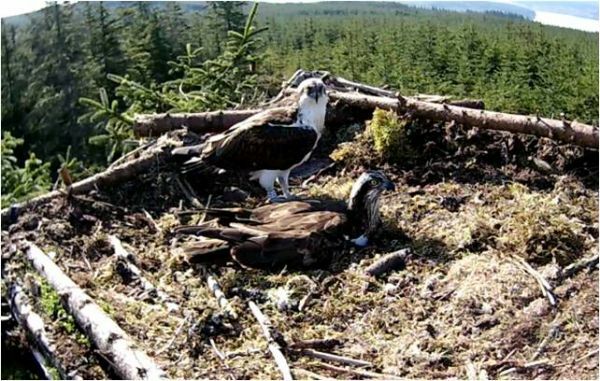 Ospreys, who caused a flap by sharing an illicit fling, have begun laying eggs in Kielder Water & Forest Park. Two of the six resident birds at Kielder were first to make the 3,000 mile trip home from Africa and enjoyed a short romance while their other halves were still away. Now, with both birds returned to their own partners in their two respective nests, egg laying has begun in the Park for the seventh consecutive year. So far, at least six eggs in total have been laid on three nests by the fish-eating birds who usually produce two or three eggs each. Kelly Hollings, Northumberland Wildlife Trust Estates Officer working with Northumbrian Water, said: “We were delighted when the birds returned to their other halves as soon as they landed. We had hoped they would as ospreys normally form faithful pairs for life. Last year, the Kielder Ospreys broke a new record, producing eight chicks from three nests and with all three breeding pairs returning, the outlook is good for this year too. For 150 years, ospreys in England were nearing extinction, but have bred successfully in the Park since they recolonised naturally in 2009. At over 250 square miles, the mix of forest and water is perfect for the species. They feast on trout from Northumbrian Water’s Kielder Water, and nest among England’s largest working forest. Nature lovers can keep up to date with the progress of the bird’s eggs by checking the blog at kielderospreys.wordpress.com or watching footage from the nest, streamed into Kielder Castle Cafe. Kielder Osprey Watch, ran by knowledgeable volunteers, will take place every weekend from when the eggs hatch to when the chicks fledge at Northumbrian Water’s Leaplish Waterside Park. Osprey Watch is organised by Kielder Water & Forest Park Development Trust and Northumberland Wildlife Trust, with support from the RSPB. The partners are working hard to ensure that the ospreys are here to stay by maintaining a high quality habitat in Kielder Water & Forest Park and safeguarding and monitoring the nest site. To find out more, go to www.visitkielder.com.